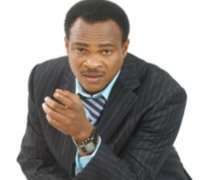 Fred Amata is a top player in Nollywood. He chatted with Glitz' Salome Johnson in this interview conducted at his office recently. In the interview, he speaks on Freedom in Chains, his new movie, He also advised the upcoming ones in the industry to work hard rather than sleeping around with sugar daddies and Godfathers to rise. 'If you will become a superstar, no amount of sleeping around around with sugar daddies or Godfathers will make you a super star' he says. Everything is fine to the glory of God. What prompted the making of freedom in chains? Freedom in chains is as a result of many years of giving and working in the entertainment industry. It came at the realization that we have given so much to Nollywood and entertainment. We have over the years been giving a lot to socially responsible films. There is none of us in Nollywood Concept Promotions that have never at one time or the other done a serious project or a particular pressing issue. Roy Denario is the MD and he was almost the architect because he did the script and he was the assistant director of Mortal Inheritance. He popularized the sickle cell through that film where Omotola Jalaade won the best actress of the year in 1997 and he won the best actor. I have done films about the addicts and the effects of hard drugs. I have also done a film with Jetta Amata on female genital mutilation and early marriage called Tears of a woman. Keppy has done a film on gender based violence titled Baby Sitter which addressed the issue of violence against women. Bimbo has done a movie on widowhood known as Widow; the morning after where she actually shaved her hair for that kind of course. So when this opportunity now came to deliver this same message on a platform that is wider and that could reach more of the audiences that we are talking about, it was something to grab and we grabbed it, took our take offs, we took huge take offs. We have been doing a lot of films for money, so we said; let's do one for the progress of the society focusing all these target issues and see if we can tie in Nollywood Concept Promotions with the vision of Millennium Development Goals (vision 2020) and that is where we are now. In what format is the movie? I thought it is on cinema? It is not on cinema, it is on video. Only one cinema film has been shot in Nigeria since amazing grace. Nobody else has shot on cinema. Teco Benson shot a couple of films on HD and burnt to 35mm and it is not the same as shooting on cinema but those are great films. That also tells you about the power of Nollywood. Is there any intention of mass producing freedom in Chains into home video in the future? Freedom in chains has become a part of campaign against gender based violence and it is no longer a for profit movie. It is a not for profit movie, it is for a course to address certain causes which includes raising awareness on the topic, generating discuss on the topic and finally affecting legislature and then behavioral change. What strategies have now been put in place to actually actualize these changes? We are working together with the United Nations Fund Population Activity and we are marrying Freedom in Chains to some of their key messages and key targets and so it is actually their strategies that we are employing because these are the strategies that has been tested and proven the world over many times over. So we are just a part of it and it is great. What we are doing now is that after we have done the film and we had our first screening in the UN house, the power of the film was so enormous and we decided that this film can not just go into a video cassette and set and go to television that this film now we should use where we go from place to place, show the film and provoke discussion and comments and hear the people talking about the issue and how it is affecting them today. Today, everybody whether directly or indirectly has one is faced with gender based violence because even if you are not the direct recipient, you must know somebody somewhere who is being faced with one form of gender based violence or the other. We need to hear these stories more and more and it in the hearing of the story that we can start to now formulate the kind of strategies that will address the issue because what we discover is that a lot of lip service can be paid to particular issue and nothing being done about it. But we discovered with the few screenings that we have had with Freedom in Chains is that it provokes people to want to talk about their situations. As they are talking, we are actually in the process of being transformed into full fledge advocates for this course. Every where we go, we have talked to resource people, and most of the times they ask us… ah Bimbo Akintola, how did you do this in the film?… Fred Amata, how did you do this in the film?… and that now opens a vista for a whole new discussion and they talk. We have had screenings in Aso Rock, we have had in Abakaliki where we showed it to the students and the women community and we had responses… in fact, we just came back from Abakaliki last week. So that is the strategy; we take the film to a particular community, local government, schools, church or social gathering; let them talk about it where there is an audience or group of people who no matter what have experienced it. In one of such screenings one girl actually came up and said I suffered this and she was bold enough to speak on; that is another issue with people, some do not want to speak about it. When you see them with wounds and you ask what happened to them, they will say 'no, I jam wall, my eye jam door' and how do you solve the problem when they are not speaking out. So it is in seeing it and expressing it that it will now elicit the emotions for them to speak out. And we have recorded some measure of success that we can score major even in this early stages of the campaign. What exactly are you going to do with these responses? Don't forget that we are working with the UNFPA and it is their primary assignment and as we go they are using world processes and strategies that they have tested before and are trusted and they are developing the low down strategies that will address this issue because if you think that we have the answer here, you are very mistaken and it is a problem. We are working with people whose job is to understand the behaviors and trends legislature and reach every where. How has this project impact on your career? }It is still young to tell but I think it is going to impact greatly on it but it is still young. How long is the project going to last? I can project but UNFPA has a kind of structure…so if they say, let's do this for this period of time,… come back, take results, look at all the reports and determine how well it has worked and how effective it is and all that but we have not reached that stage yet, we are still at the preliminary stage and this will last for may be till December before we can now come back and say let's see what has happened move on. Like I said earlier, this is only a part of the campaign. There other strategies that also include television and other things that will come to play so that it will be whole with the driving force; Freedom in chains. Will this project not interfere in the other aspect of your film making career? This is my career, I make films and I travel. How can your career be big and you say it will affect your career? It is my career. I am a film maker, I am a film business man, I am a film entrepreneur, and so if I am doing anything on film, it can not be interfering with film. As an actor and a film maker, how do you work to fit into your character? In Nollywood, enough time is never ever given to either the producer, director or actor to prepare for roles in the movies. So what you actually see in Nollywood is five to ten percent of the ability given of any actor, producer or director to perform at his output. So when you look at Genevieve and you say.. ah she did well, she did it with only five percent time for preparation and for the actor, preparation is key so much so that the great thinkers in acting wrote a book and the book is titled 'The Actor Prepares' and it is one of the greatest books that any actor can read. I advise people who have not heard of it before who actors to go look for that book and read it and understand how actors prepare. I will not tell you that we don't prepare because a script is thrown to you in ten minutes and the only time you have to prepare you do something ; it is that something that I am going to refer to now as the preparation. When your script is given to you, you read the script and what happens to you automatically as you are reading the script is that as you are reading the script, you are borrowing from your life experiences, you are borrowing from what has happened to you, what has happened to your brother, your sister, your friend or your acquaintance and then other things that you have seen and heard. It is an unfortunate line for preparation because if you are gathering all that information and you are preparing with what they know, you are not prepared. Mean while, the Nollywood actor don't have more than one week to prepare for any role, it is hard. The answer will not be different from why whatever business you are doing in Nigeria is like what it is. It is what I will call the Nigerian factor is what affect proper preparation and it is even worse in Nollywood because we there are no proper structures so anybody is anything. The closest structure that exists is the census board which is just to censor your film and regulate practice but the practice that the census board is to regulate; we have not reached there yet. So everybody is doing everything anyhow they want. So if you are in a position to effect any change in the Nigeria movie industry, what will it be?Yes I will like to see a more structured practice which affect the quality and affect the returns. Why do you think there is no proper structure in the movie industry? It is because the industry developed itself. The industry is as big as Nigeria and as variegated as Nigeria and yet, it developed itself so you have a lot of pockets of ideas that are all part of Nollywood. There is no one pocket that you can say; it is too small, remove it, no, they will raise their head. And over the years, a lot of people looked down on Nollywood. Nollywood is like the rejected stone by the builder because when we started, it was always with complain from people from diverse profession… you don't know how to do this, your shot is like this… until we have what is Nollywood today. Even though some of my friends believe that Nollywood is collapsing; I believe that Nollywood is about to explode. And that is why you see that our organization has large as UNFPA and you will say; we buy the idea that we can use Nollywood to in a larger way not just about film making because Nollywood also deliver you role models and it is not only in the movie industry alone but the entire world organizations and sectors is expecting Nollywood to deliver key issues. So, it will change and it is about to explode. How do you joggle family life and work?I don't know how I joggle it but to God be the glory. Who is your role model?Yes, my father, John Ifeghalli Amata, he is a film writer. In 1957 he shot the first color film made in Africa.So could that be part of the inspiration that prompted you into the movie world?Of course he was my role model when I was growing up. I grew up in the time of carboid film and open air shooting where you go to watch film… there is a film showing in primary school field or in …auditorium and everybody is alerted to come and see and when you ask what they are showing… John Wale and in t hose days it used to be silent movies and you have the commentators running commentary like they do to Nigerian films now in francophone speaking countries. At that time, when everybody was watching John Wale, I was following my father showing his film and it was John Amata showing his film, I will shake my head; I wanted to be like that. My father now bore a son called Zack Amata and he studied Theater Arts and when I was in secondary school, my brother was on TV for Lagbondo and subsequently Behind the Clouds. I wanted to be like my father. Do you have any regret being in the movie industry? That takes me to a philosophy of life, regret is not… what are you regretting when the thing you are regretting might just be the thing that have made you a better person today. Every failure is a learning process and should not be regretted, it should be cherished.What is your opinion about sexual harassment is it real in Nollywood? Is it the same in your industry? I don't know, may be, and may be not.If you can not speak, then I can not speak too. What advice do you have for upcoming ones aspiring to be like you? If I say this, it may sound stereotype but the truth of the matter is that if anybody believes that he wants to be in the industry then the truth of the matter is that if you must come into the industry, you must be ready to work because nothing is going to come to you easy. No Godfather is going to turn you into a superstar, they have tried it in Nollywood and it has failed. No amount of sleeping with anybody will turn you into a superstar. If you are going to be a superstar and you have wasted your talent sleeping with people, you just wasted it because you were still going to be a superstar because it is not everybody that will be a superstar. When I say superstar, I mean a celebrity that is adored, loved and appreciated just a little bit above his or her contemporaries and those people come rarely in the world and we have what we call the x factor which nobody can do anything about. So for those who think that they don't have it and they just have to go through Godfather or sugar daddy or whatever, I will just say work hard. What is your grooming taste like, are you a designer freak? Unfortunately I am not. My style comes from all over the world. I am a creative person so I get doses of madness. I can decide right now that I am going to be wearing black now and I will see myself wearing black for the next six months and suddenly I discover again that I want to be wearing jeans, I want to be wearing suits. So that is just me. You have played so many roles in the movies so how would you describe yourself? It is an unfair question to me at this point in time. If you asked me this question six months ago, I would have given you a direct answer but right now, Fred Amata is undergoing something special and I don't want to talk about it. I love starch and Banga soup. I play football and I have the opportunity of training regularly.